Expert Electronic Transmission Diagnosis & Repairs * CV Joints * Full Clutch Kits Fitted * 3 Year Nationwide Warranty on Auto Rebuilds * Specialist Servicing * Quality Rebuilders * Exchange Units & Spare Part Sales * 4 x 4WD Specialists * Clutch and Flywheel Machining (Grind) * 12 Month 20,000 Km Warranty * 3 Year 60,000 Km Warranty on Rebuilds * Licenced Repairer - MRB4670 * Motor Vehicle Repairs * Four Wheel Drive Repairs. ROCKINGHAM DIFFERENTIALS MANDURAH. 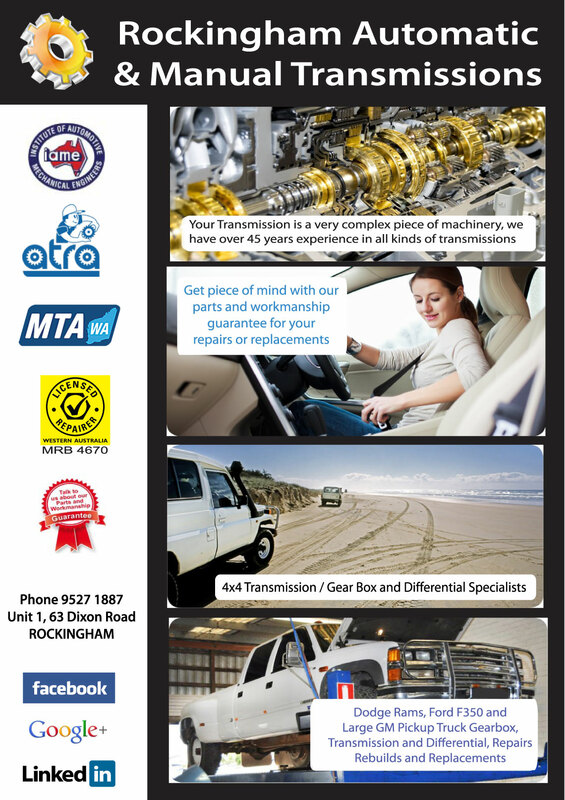 KWINANA DIFFERENTIAL SERVICE.